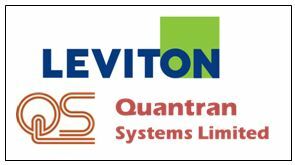 Leviton recently announced the acquisition of Quantran Systems Limited. Quantran’s products, capabilities and presence in strategic international markets further expand Leviton’s global strength in commercial lighting control systems. Quantran Systems Limited’s head office and factory is in Watford, United Kingdom. For more than a quarter of a century, the company has pioneered, designed and manufactured Architectural Dimming & Lighting Control Systems. The company is respected and recognized around the world for its technical and manufacturing capabilities to meet any market standard, as well as custom-made products. The company has a vast experience of working as a professional partner with electrical consultants, contractors, architects, lighting and interior designers. Combined with Leviton’s worldwide distribution and sales channels, the acquisition will enable Leviton to offer its customers the most complete line of lighting control solutions to meet international market requirements. A complementary strategic addition to Leviton’s current line, Quantran systems are easy to install, simple to program and easily integrated with third-party audio/video, heating, ventilation and air conditioning (HVAC), building management systems (BMS), fire alarm & curtain control systems. A focus on product innovation, technology, reliability and quality has made Quantran a market leader in the area of dimming and lighting controls worldwide.